My grandma, Florrie Thomas Martin, belonged to a seniors group at Wesley United Methodist Church in Vienna, VA. The group was called Never Grow Old. They met monthly for a cover-dish lunch and a time of fun and fellowship. 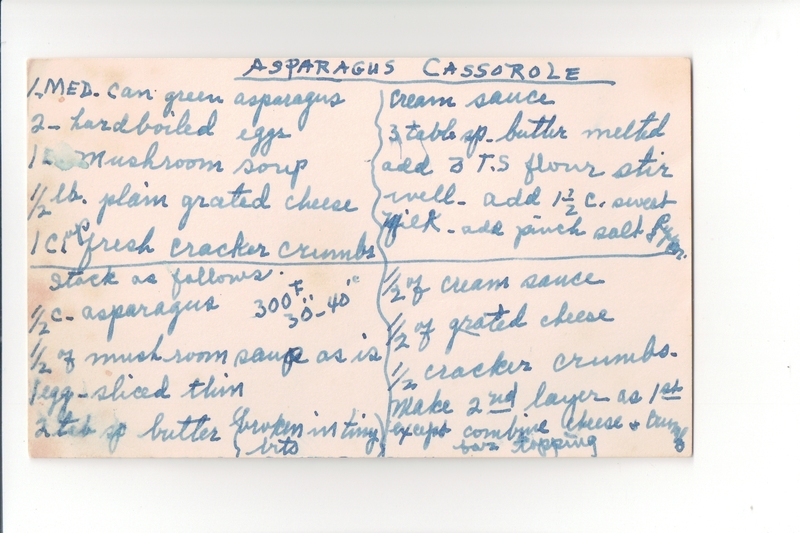 My grandmother almost always brought an asparagus casserole. Everyone at Never Grow Old loved it. In the beginning my grandma made it but as she got older my mom, Gladys Martin Heiser, would make it and Grandma would just bring it along to the gathering. I don’t care for mushrooms so I never ate this casserole, but everyone I know who’s tried it liked it.